In this post, we examined 5 of the best-selling bed risers online today. A bed riser is usually a plastic or metal pylon that gives height to your bed for the purpose of putting drawers, boxes or bins underneath your bed (Source). With a helper, take the mattress off your bed and then lift up the frame and place each riser underneath the casters or legs of the bed frame. 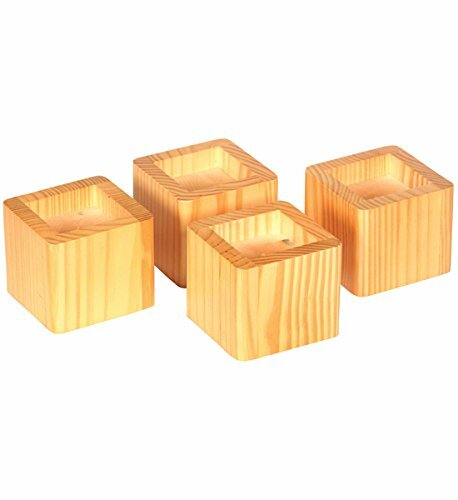 When choosing a set of bed risers it’s recommended you choose a solid material, such as wood, over plastic. Solid materials are more stable and have a near zero chance of collapsing. Also, if your bed frame rests on casters, make sure you know the diameter of the legs/casters to get the best fit (Source). The Slipstick 2 inch bed risers are perfect for raising beds, chairs and other heavy furniture where underneath storage space is needed. These risers are capable of supporting up to 2,000 lbs. and feature a recessed top to hold standard 2-inch caster wheels securely. Although they’re plastic, most buyers agree they’re very sturdy and securely hold everything from desks to tables and beds. Lastly, these are designed so they don’t mar your floors (Source). Next, we looked at the Home Solutions 8-piece adjustable bed riser set, which gives you options for raising furniture 3, 5 or 8 inches. Like the previous risers, these also feature a recessed top for securely fitting caster wheels and bed posts. Because you can raise your bed up to 8 inches, it’s recommended you use additional center supports with king or queen-sized beds. Like the previous, these are also designed to keep your floors safe and in good condition. The Whitmor bed risers are made of durable plastic like the previous models we looked at and add 5.25 inches to the height of your bed, table or desk. Like the other risers, these also feature a recessed top for securely holding bed posts or legs with caster wheels. While buyers were generally pleased with the durability and the height they got, some said these risers lacked a bottom surface that would protect floors. The Richards Hardware bed risers are made of solid mahogany that come in a few different colors depending on your decor. These provide 3.5 inches of lift and also feature a recessed top for securely holding bedposts, and wheel casters. Because these risers are square and not pyramid shaped, some users claimed the bed easily rolled off the risers. Last up is the Home-It adjustable bed risers which raise your bed or other furniture up to 3, 5 or 8 inches. They are durable plastic and can support up to 1,300 lbs. Like the other plastic risers we looked at, they feature a wide base and a recessed top for a secure fit. Lastly, these also have a no-slip bottom designed to protect your floors. This adjustable bed riser set offered by Home-it is handy, well-made, and an excellent choice if you need some extra height for your bed or furniture. Users love the price and the quality, but some do note that it’s made of plastic. The Home-it bed/furniture riser set features four large bed risers and four small ones with an opening of 3” x 3” x ¾”, so you can adjust the height with 8, 5, or 3 inches. These adjustable bed risers can safely support up to 1,300 pounds. Another excellent thing is that they won’t scratch or dent your hardwood floors. In addition to this, the bed leg risers have a built-in recess cup to fit bed lifters or casters securely. They are available in black and white. As a whole, buyers have a favorable opinion of Home-it adjustable bed riser set, and they praise its construction and functionality. A buyer comments that the black bed risers turned out to be sturdier than she expected and they can withstand 800 lbs. without cracking. The reviewer also notes that they are convenient if you want some extra storage space beneath the bed. Another user adds that the furniture riser set arrived well-packed and that the three height options allow you to experiment until you find the perfect height for the bed. However, some customers have noted that the bed risers are plastic and that they break too quickly. Some also complain that the provided measurements are not correct. If you’re wondering how to raise a bed frame off the floor, these wood bed risers offered by Richards might come in handy. Users love that the risers are made of wood, but some do note that they are too visible. The Richards bed risers feature a set of four stackable bed lifters that measure 2.8″ x 2.8″ x 0.8″ internally, and 4.25 x 4.25″ x 3.43″ externally. You can place the bed risers under the legs or the wheels of your bed, and you’ll gain an additional 2.25-3.25 inches in height. The wood bed risers are available in mahogany, honey, and espresso. Keep in mind that if you want to lift your bed/ furniture even higher, you’ll have to purchase two sets of bed risers. A buyer comments that he is using the Richards wood bed risers on hardwood floors and that he hasn’t had any issues with sliding. He also notes that a single block will raise your bed or furniture about 3 inches and that you get two sets and stack them for additional height. Another purchaser mentions that these 3” bed risers are easy to install and that they don’t stand out too much. A user adds that he used the wood bed lifters on bunk beds and that he is satisfied with the results. However, some customers have noted that when you stack the risers they are not stable and that the bed falls. Some users also complain that the furniture lifters slide on the floor and that they are not as safe as they expected. 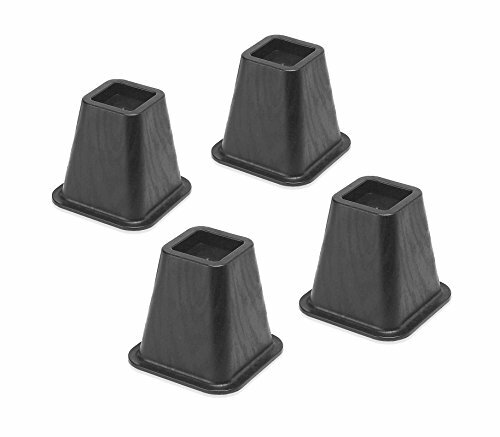 These black risers for beds and furniture offered by Whitmor are sturdy, easy to use, and well-made. Users love the that the lifters create an instant bed storage space, but some do note that they are larger than expected. The Whitmor black bed risers measure 6.375″ x 6.375″ x 6.0″, and features four lifters that fit any bedposts up to 2.63”. 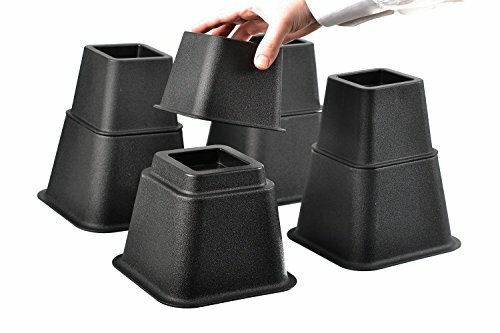 Another great thing about this product is that the bed risers add additional 5.25” in height, and they’re made of durable molded plastic to ensure that the bed stays in place. In addition to this, you can stack the risers when you’re not using them. In general, users are impressed by the quality and sturdiness of Whitmor black bed risers, and they highly recommend them. A buyer comments that the bed risers feel solid and that he hasn’t had any problems with his bed falling. He adds that they really lift the bed three inches and that you can clean underneath easily. Another purchaser mentions that the Whitmor black bed lifters arrived quickly and that they were in perfect condition and matched the provided description. A reviewer also shares that the bed risers are sturdy and durable and that they can withstand up to 200 lbs. with no issues. However, some customers have noted that the lifters are made of plastic and that they will break from the constant pressure. Some also remark that the bed risers are too bulky and too visible. If you’re wondering how to raise a low bed and gains some storage space, you might try these adjustable bed/furniture risers offered by Home Solutions. Users love the extra height, but some of them do note that there is a chemical smell present. 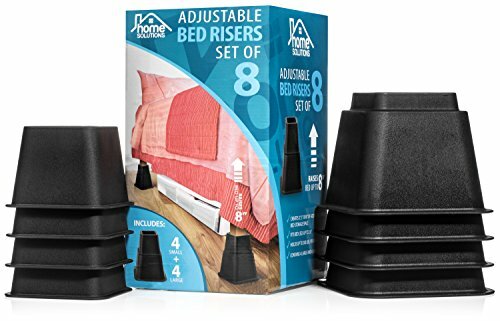 The Home Solution bed risers set features eight pieces, which you can use to adjust the height of your bed, chair, or sofa with 3”, 5” or 8” and create under-the-bed storage space. Another great thing about this product is that it’s suitable for single or double beds, and it will fit any posts up to 2.75” in width. In addition to this, these adjustable premium bed risers have smooth plastic edges, and they won’t leave scuff marks on the floor. As a whole, buyers have a high opinion of the Home Solution premium adjustable furniture risers, and they praise their quality and sturdiness. A reviewer comments the premium furniture risers work better than the initially expected and that they hold the weight of a standing desk with two monitors on top with no problems. Another purchaser states that the risers blend well with his wooden floor and that they’re perfect for anyone who has trouble getting in or out of bed. 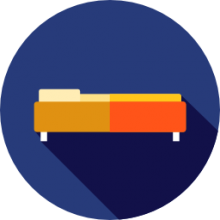 A user also remarks that the Home Solution adjustable risers fit the wheels of his sofa well and that he highly recommends them as one of the best bed risers. However, some customers have noted that the bed risers don’t fit their beds and that the bed slides easily. 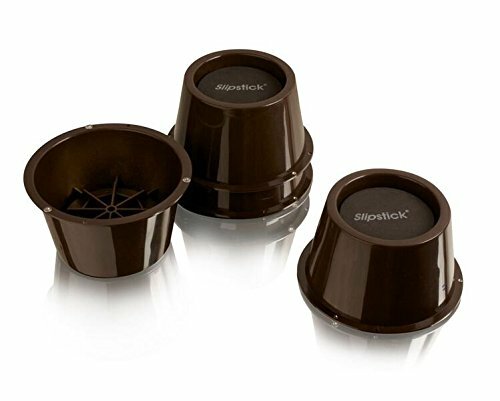 These furniture/bed risers by Slipstick are solid, multifunctional, and an excellent choice if you want additional storage space under your furniture. Users love the design of the lifters, but some do note that they’re more conspicuous than they expected. The Slipstick 2” bed riser set features four pieces that fit standard 2” caster wheels and furniture legs 1.25” to 3” in diameter. In addition to this, these 2” furniture risers have a built-in recessed holder cups with memory foam pad to secure wheels and legs in place. Moreover, these heavy-duty bed risers can support up to 2000 lbs. However, keep in mind that the furniture lifters are not suitable for legs under 32 mm. A customer comments that the 2” furniture lifters are sturdier than he expected and that they arrived well-packed. He adds that they raise a twin bed with no issue. Another reviewer shares that the raisers lock firmly in place and that the soft padding inside protects the furniture’s legs. He highly recommends them as one of the best 2” bed risers. A user also states that the lifters give him just the right amount of height and that they work well on wheels. However, some customers have noted that the lifters are not as stable on a carpet as they expected and that they broke quickly. If you need your table, chair, sofa or bed to sit higher, you can use bed risers which provide a simple, affordable and easy to install way to do this. Bed risers can provide quite practical solutions to a range of problems. Bed risers are fit onto your bed posts’ feet to raise them a few of inches, a foot or even more. They can be used also on other furniture, for instance, sofas, tables, chairs, etc. They can lift your bed, thus providing extra storage space beneath it. This is ideal in cases when additional space is of great importance in a smaller apartment or condo. These risers can also be useful for taller people. Some people may be satisfied sitting down on a sofa, chair or bed that is a tad higher. This can as well be worthwhile for people who have restricted mobility. In actuality, you can use short, sturdy bed risers on the front legs of a piece of furniture only, and this will provide some tilt and will make it easier for you to get up from a seated position. It can also make working at a table more comfortable, as you will not have to bend and strain your back too much. You can also use them for elevating the head or foot of your bed if medically indicated. In some cases, they can even be used for helping furniture set level, in spite of a slanted floor or base. Risers can be placed on computer desks or tables to make more space between a person’s legs and the bottom of the surface for proving greater comfort. It can be perfect to use them for making extra space for a person in a wheelchair. Determine what type of risers you want. Bed lifts have two basic styles: block-like risers which are placed under each bed leg and oblong-shaped risers that have a slotted clamp which slides over to the end of the frame and lifts the entire bed frame off the floor. You need to consider your bedroom, as well as your preferences before choosing the type of riser so that it fits your bedroom furniture to the maximum. Lift one corner at a time. You need to lift one corner of your bed so that it is higher than the riser. You just put the bed-frame riser in a particular position by putting it on the floor under the leg to get a rectangular box type. In case you have an oblong slotted riser, you can slide it onto the end of the bed frame. Lower the bed into position. You should lower the bed’s corner until its weight rests on the bed riser evenly. If your riser is of a rectangular box-type, the bed’s leg will sit squarely on the riser. Repeat the process with the other three corners of your bed. The risers need to be right at your bed frame’s each corner, either slipped over the end of the frame or supporting the legs. Now your bed will be level, and it will give you additional storage space beneath it. You need to make sure that each corner of the bed lies on each bed riser securely before you put any weight on your bed. Having the storage space, you’d better use it wisely. You can get under-bed bins that will keep the space in order, and small items will not get lost under the bed. Similar items can be kept together in each bin: you can store blankets and sheets together in one bin, and out-of-season shoes and clothing in another.